The next few days brought some relief to Duffy. Word had gotten out he wasn't quite the foreign devil as originally thought. People started talking to him. Instructions to the contrary, some of the young folks started opening up and he got more than earsfull. As suspected, many of the "kids" lived difficult lives before arriving at this "in between". The "school" provided an environment of compariative quiet (Aside from the Battlefronts' forays.) and stability. The family life many had experienced while living was either extremely dysfunctional/abusive in some way or altogether nonexistent. Others encountered extreme handicap, emptiness or something life changingly traumatic. To most of these young ones, this though not Heaven, was certainly not hell. Some looked on it as an opportunity for what they couldn't do or before lacked. Others, a "breather" from previous lifes' tragedies. 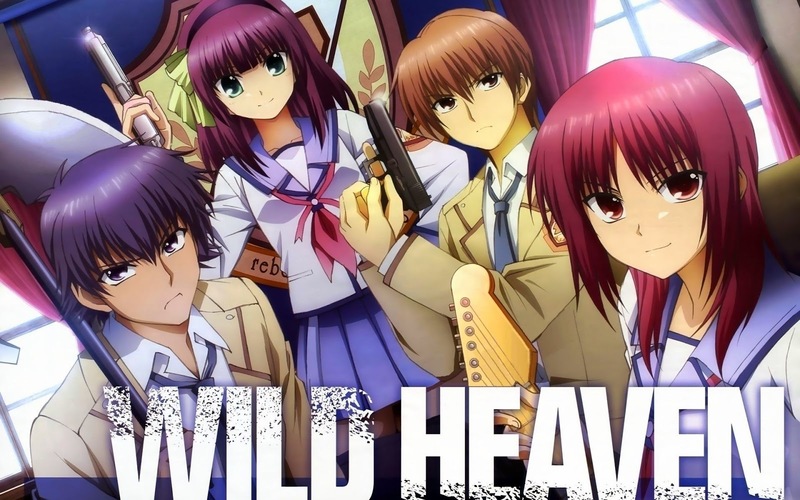 As for the Battlefront, further info gleaned from other students confirmed what he pieced from before: These kids blamed God for past lifes' troubles. By keeping themselves from whatever "fulfillment" they could be seeking in this otherworldly "second chance", they were, by their very presence and rebellion, going their own way thinking they were giving a stiff middle digit to God. In doing so, Duffy reasoned, they were only making their misery worse thus hurting themselves much more than the deity, as if He could be hurt. Though there had to be some "compensation" in the thrill of defiance, he doubted that made up for it. Entropy, though greatly reduced in this strange place, still had it's effect. "Now who said it?" Duffy questioned in his mind. "'You can't even break even.' Something like that ..."
With only a day or so before starting work, an incident took place he thought would bring his truce with the Battlefront to an end. After an afternoon spent studying schedules and re-exploring various locations, Duffy entered his apartment ... and froze. Someone had been here, though not long. A very amateur job, a window had been jimmied. One with a nail board under it. A trail of blood led from the window to the "toy room" housing his electronics and movie collection. He could see two had been there as another set of non-blood prints in the carpet revealed. That set of prints also led to the "toy room" with a stop in front of another window with an unsprung leghold trap under it. Peering out the damaged window and down, ladder marks evident in the grass. Jack immediately went to the phone and dialed. Hinata, who had been lounging lazily on an office couch sat up abruptly. Yuris' yelling into the phone brought him out of a semi-pleasant snooze. "I told EVERYONE ... specifically ... NOT to make a move on him of ANY kind! TK, you two get your sorry butts up here RIGHT NOW! ... I'm gonna have to make a call and apologize ... BIG TIME ... NO! You two idiots can explain when you get here." Yuri looked up, Hinata approaching the desk. He didn't need to ask. Holding her hand over the mouthpiece she said, "I can't believe this! Noda and TK broke into Duffys' apartment. They're on their way over." Hinata couldn't believe it either. Someone ... ANYONE ... having a coherent conversation with ... TK? "Uh ... yeah ... sure." Puzzled, Yuri handed him the phone. "Hey TK? ... uh ... TK? Shoot!" "Those ... jerks! ... MORONS! ... Gimme the phone! Gotta call Duffys' and leave a message." Hinata jumped a second time as the phone in his hand sounded off. "Don't think you need to," he said handing it back. "Mmmm ... Hello?" Yuri answered in uncertain greeting. "We ... need ... to ... talk." "Yes ... we ... do ... They did it on their own and they're on their way up. I'm chewing their posteriors out but good. I take it you'd like to be in on this?" "The halberd guy and Michael Jackson? On my way!" Setting the phone down, Yuri was momentarily thoughtful. "Michael Jackson ... heh!" After press checking both .45s, Jack stalked out of his apartment and off to Class B. If what Yuri said was true, he had nothing to worry. He hoped he wasn't walking into a trap. Of course they could have made a move on him anytime the last few days. As he rounded the corner of Class A, debating wether or not to phone negotiate for a cafeteria meeting instead, a rumbling crash had him looking up. He just had time to see a mangled body hurled through a smashed three story end window of Class B before ducking a falling halberd, the axe-pike clanging to the ground a few feet away. He jumped back, avoiding glass shards and the bloodied body of a very dead Noda. He looked up in time to see the head of a huge wooden mallet swing back into the buildings' window. "What ... in ... the ... name ... of ... God ... and ... Chuck Jones (1) ...?" Jack knelt beside the body realizing anything he could do in the way of aid useless. Protruding bones, caved skull and the huge forming blood pool more than showed the young man to be beyond help. He gently pulled the corpses' eyes shut. "Don't count him out just yet." 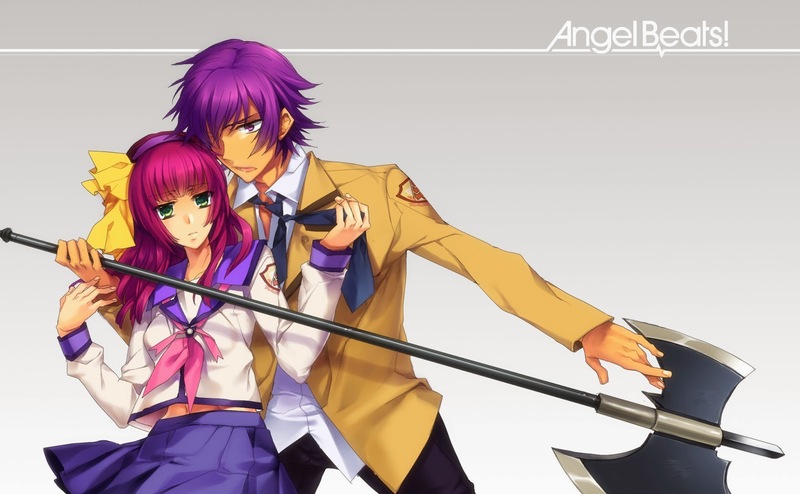 Shiina, standing next to him. Her being right there didn't spook him this time. "We'll have to do something ... make arrangements ..."
"We won't have to do anything. He'll be fine, he'll-"
Jack stood abruptly up, looking squarely into the eyes of the ninja. "We have a man dead here ... Brutally killed ... And I find your lack of concern ... disturbing to say the least." Off to his left. Duffy noticed Matsushita and some non-front students running up. Looking down, the man saw the blood had stopped flowing and the body not as twisted as before. He stepped back in near shock as he saw cuts, slashes and contusions healing, fading. No more bones exposed, the body breathing. He felt Shiinas' hand on his shoulder. "No one dies here ... ", she explained, "remember? ... We're ... already dead." Jack quickly looked up, noticing the window two floors above, the concerned faces of TK, Yuri and Hinata peering down. No glass on the ground in evidence. He stared about at the thoughtful faces around. Not mocking or pitying, they obviously were remembering their first times and beyond with death. Matsushita helped Noda up, a sheepish look on the not so dead mans' face. "His own trap too," said the big guy. "You'd think he'd learn by now." "Damnedest thing I've ever seen ... ," Duffy could say little more. Shiina looked on. "Yeah ... damnedest ..."
Jack, along with Hinata, Yuri, Matsushita, Shiina and the two miscreants were seated in the "principals'" office. The dressing down the two recieved, if an act, was a most convincing one. Yuri really was furious at them for going off on their own though Duffy was certain she was as ticked off about it being so amateurish and obvious as they're having done it at all. Still, she seemed sincere enough in her decision in not having her group move on him. She ran a tight ship, was proud of it, and would brook no nonsense from any subordinate. Noda did what he did out of pure stubborness and intense loyalty. TK, still limping from the nail board (Though he didn't need to. ), accompanied the hothead on the spur of the moment out of curiosity. The two sat in subdued silence as Nakamura and Duffy did more or less a rehash of their meeting some days before. Yuri reiterated the way things were at "the school" as well as their side of their grudge against God and his perceived agent in Angel. Jack, on his part, laid out in no uncertain terms he was as much in the dark as to his being there as they were. "Merely trying to make the best of a bad situation as I think, are you ... albeit in a different way." "You see how we're doing it," the leader stated. "How are you going to go about it?" "It's obvious to you I'm trying to get the 'lay of the land' here. As a new employee of the school I need to know the work place. For the time being, I'm going to go with it and "play ball" so to speak." "Could get you obliterated ..."
"Only if what you and ... kreepy kid," laughs and chuckles all around, "say is correct ... If I find the job uh ... uplifting and fulfilling." "You never found work to um ..."
"Edifying and rewarding? ... No. It's just a job to me. A neccessary evil taking up my time thus keeping me from things I like to do. "Don't misunderstand. When working I do the best job I can. It's what I get paid for. I just never clung to the so-called ideal of 'Arbeit Macht Frie'." Most of the younger ones returned a puzzled stare. "German for ... 'Work Makes You Free'. Long, nasty story behind that one." "I know something of it," Yuri answered. "Besides, if what you say is true and I've no reason to believe it isn't ... My situation may be a bit different from yours being as I'm the only non-Japanese ever to be here. My life ... well ... I've had my ups and downs, wins, losses. The only really traumatic thing that's happened to me is my being here." "What I do know ... feel ... Is I'm here for a reason. What it is ... well," he shrugged, "we'll see." He refrained from adding: "Who knows? I might even be siding with you." He didn't want them thinking of the alternate possibility of his being allied with Angel. "I doubt I'll be taking off any time soon." Jack examined the hall ceiling as he left. NO sign of the mallet trap to be seen though he knew it to be there. He shuddered inwardly, recollecting how close he came to dying a second time some days before ... and not knowing it. "OK, since you've been there, you might as well tell me what you've seen." "Yeah. No sense wasting perfectly good intel ..."
"Not much, With TK bleeding all over the place, we were only there a few minutes." "We eell ... He really likes movies." "Has to have at least 10 shelves of discs ... some two deep ..."
Noda momentarily thought that odd. "Mostly foreign. Everything was in Romanji ... English I think." "I figured that." She was getting a little exasperated. "I mean type." "You know ... romance, action ..."
"Looked at some of the covers ... Big section of science fiction, horror ..."
Yuri thought a moment. That partly explained his resilience in dealing with his present percievedly unreal situation. "I take it ... He had that stupid little show in there?" Back at his apartment, Jack found little sign of the break-in apart from the prints in the carpet. All traces of blood gone, window damage nonexistant. A thought occured. If this place could repair itself ... was ... "self healing" so to speak. Then his reason for being here was definitely not for maintenance. "Well ... again," he thought. "All in Gods' good time." 1. Charles Martin "Chuck" Jones (9-21-1912 to 2-22-2002), animator, artist, writer, director of animated film shorts for theater and TV. Most noted for his work for Warner Brothers studios in the Looney Tunes and Merrie Melodies cartoons (Bugs Bunny, Daffy Duck, et al.). 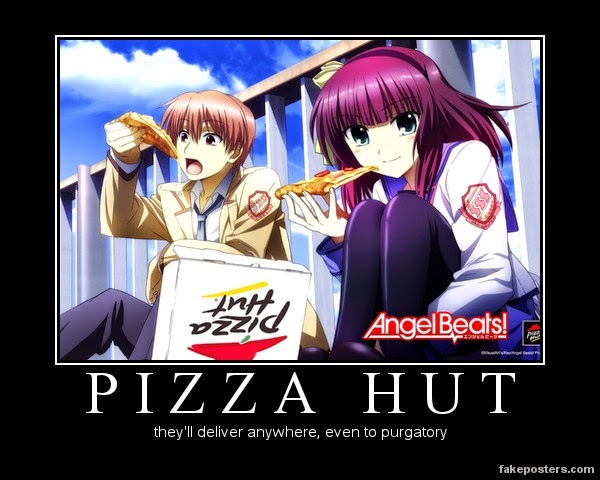 Angel Beats, In Gods' Good Time chapters 1, 2, 3, 4, 5, 6, 7, 8, 9. To to Jays' Tee Vee blog main page here. tertainment purposes only. I make no claim to ownership of the names/characters, places, & events mentioned in this work that are the intellectual properties of others. They are the sole properties of their respective owners. Please, by all means support the owners of such properties in the purchase & enjoyment of their works.